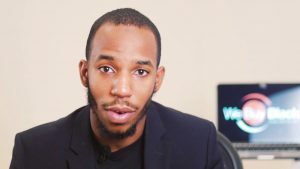 Shareef Abdul-Malik, the founder and CEO of We Buy Black. Editor: Tell me about the upcoming We Buy Black convention. What can attendees expect? Shareef: The convention will host 100 dynamic Black-owned businesses. Attendees will be able to conduct business with these vendors while they walk through the convention. You'll be able to pick up everyday items, like Coral Oral toothbrushes or True laundry detergent, or sign up for a personal account with our presenting sponsor, One United Bank, the largest Black-owned bank which is based in Compton, California. There will also be workshops for entrepreneurs to attend. These workshops will feature Black business owners who will provide their insight on how to navigate the world of entrepreneurialism. We'll also have several speakers who will address all those in attendance about the importance of buying Black. There will even be products and activities for the kids, like books and toys that are sold on We Buy Black. We're also going to have Black-owned food vendors at the convention, so attendees can eat in between their shopping. The co-founders of the international clothing company FUBU will be hosting a fashion show at the convention highlighting other up and coming Black-owned fashion lines. We're also going to be providing entertainment from a myriad of local artists from Atlanta. 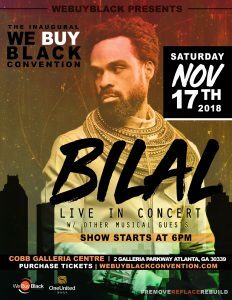 And it's just been confirmed that the musical artist, Bilal, will be headlining. We are super excited to have such big names, like FUBU and Bilal attached to our inaugural convention. E: What is the goal of the We Buy Black Convention? S: The goal of the We Buy Black Convention is to highlight Black-owned businesses and their products. We want to expose customers to these Black-owned businesses that are not mainstream but provide valuable goods for our community. We also want to bring attention to the fact that there are goods and services that the Black community still needs. 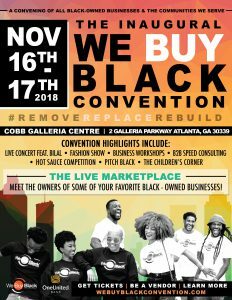 The goal is that by the next convention, we will be able to feature Black-owned businesses that have since been established and provide those much-needed goods. We have embarked on a Movement to produce everything we need and this is how it begins. E: Why is buying Black important? S: Humans innately want to support one another. But the harsh reality is that one cannot support others until they take care of themselves. When an airplane is crashing, for example, passengers are told to put their oxygen masks on before helping anyone else. If a passenger does not put their mask on first, they run the risk of passing out and then they will be of no help to anyone. You have to take care of yourself first. The Black community often has a spirit to want to help everyone, many times at our own expense. But before we can become leaders in the world, assisting other communities, we have to be able to support ourselves first. We also have to build the Black community that we want to see. We see the Asian community thriving with their businesses, we see the Mexican community thriving with their businesses. They are able to circulate their dollars in their communities for a substantial amount of time. The Black community is not there yet. But we need to be there. The best way to do that is to build communal wealth. The Black community has the highest poverty, unemployment, and homelessness rates. That's because we cannot [maintain] our own lively hood. We have what is called a cold economy. If you think of an economic system as a body, then just as the body needs blood to circulate in order to keep it warm and alive, an economic system needs money to circulate in order to keep it functioning. Without that circulating money, we get a cold economy. That cold economy produces cold-blooded people because they are unable to afford the normal expenses of life, which makes them selfish and abnormal. With a warm economy, members of the Black community can focus on helping others instead of constantly worrying about their finances. E: So, what if you have a person who wants to support We Buy Black and the vendors at the We Buy Black convention but they only have maybe $5.00 to spare. Will their contribution of $5.00 really make a difference? S: If you have 1,000 people who are willing to spend $5.00 a piece, now you have $5,000.00 being circulated back into the Black community. It's important that we as a community come together collectively. We want the same thing that any other demographic wants: the ability to function in and sustain beautiful communities. We need organized money in order to do so, so $5.00 here or there really goes a long way. I say organized because as a group, we have plenty of money. However, our dollars are serving other communities. This is what I call "slave dollars," money or resources from a group or entity that works to build the life of another group while neglecting itself and receiving little to no remuneration for its work. E: Now, I'm sure we've all heard comments like, "If it's made by Black people, then there has to be a problem with it? With that outlook on Black-made products, why should someone buy Black? S: Mistakes should not be attributed to skin color or race. An error is an error. A glitch is a glitch. 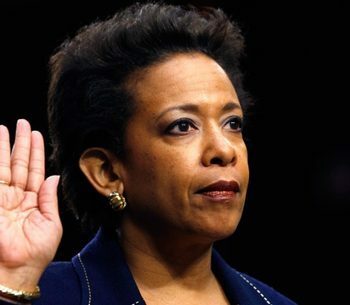 All companies--whether Black-owned or not--experience errors, glitches, and setbacks. If anything, that only shows that the company may lack the means to troubleshoot those errors and glitches and are in great need of your financial support. Again, however, that cannot and should not be attributed to the race or skin color of the business owner. It's not biological, it's environmental. 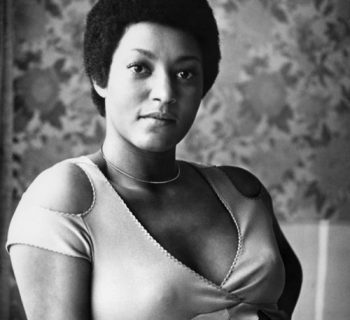 Every day we see non-Black-owned businesses that read "established in 1870," or "established in 1890," well that's decades of mistakes and successes passed along to form a perfect business. However, in 1870, our people were just coming out of slavery, in the 1950's we were fighting for equal rights, and in the 21st century, you have large corporations, banks, and insurance companies being sued for racial discrimination. These are not excuses a business owner should make, however, this is a sentiment the consumer should keep in mind before yelling "I'm never coming back here anymore." We Buy Black and the vendors that we do business with are attempting to provide excellence for the Black community. We are in the beginning stages so there will be some hiccups. Every business has a rough start and Black-owned businesses have it ten times worse. There are more factors working against Black business owners. The stigma surrounding Black-owned products being innately subpar is one of those factors working against us. Once we as a community learn to value ourselves, we'll stop making those [pernicious] comments and really begin to build something beautiful. In The Autobiography of Malcolm X As Told To Alex Haley, Brother Malcolm spoke of economic independence. He stated, "Our businesses sought to demonstrate to the Black people what Black people could do for themselves--if they would only unify, trade with each other--exclusively where possible--and hire each other, and in so doing, keep Black money within in Black communities, just as other minorities did" (Haley, 263). We Buy Black is the modern incarnation of Brother Malcolm's quote. We all know that the Black community faces monumental issues. Many of those issues could be eradicated if we had economic independence. By building a self-sustaining economic system, the Black community will be given a voice within the world that we have not yet had in modern times. 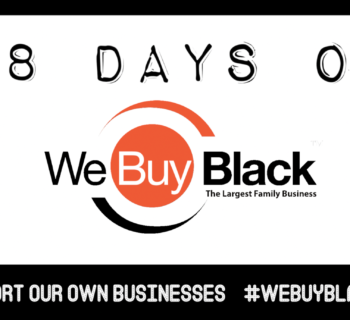 By attending the We Buy Black convention, you will be supporting much more than We Buy Black or it vendors. You'll be supporting an effort to change the perception of not just Black people in American and others of African descent, but all peoples of the world. And your support is of the utmost importance. We Buy Black is asking for sponsorship from businesses that can afford to do so. 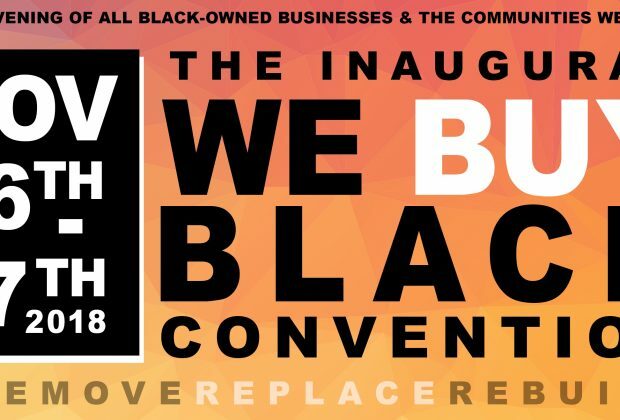 To learn more about sponsoring this convention, please click here: https://webuyblackconvention.com/sponsor.